How many people a day travel the Lower Loop in the summer, do you think? 100? 200? In fact, thanks to a study done in 2015 by Brian Lieberman as part of Western State Colorado University’s MEM program, in conjunction the CB Land Trust and the BLM, we know how many. On average, in summer, the Lower Loops sees 426 visitors a day! It peaks at 906 on July 4th! Annually, that’s 100,000 visitors to the Lower Loop and Gunsight Bridge. That’s a ton of people! They go the Lower Loop for good reasons. The trail rolls through gorgeous aspens and wildflowers. It parallels a pristine river. It offers unparalleled views of Paradise Divide. It is our only true “beginner” trail in CB (though some beginners do beg to differ on that), and it offers folks who just arrived from the lowlands a way to access CB’s natural bounty without having to climb 2000 feet of elevation right out of the gate. So, it was a no-brainer for CBMBA to donate when the CB Land Trust started fundraising for their campaign to build the new Gunsight Bridge. Not only is the old bridge in sore need of major repairs, but the new Gunsight Bridge will also improve the ecology of this fragile riparian ecosystem and improve the wildlife habitat for the animals like beaver and Great Blue Heron that live near the bridge. You can learn more about the what, the why, and the how by visiting the Land Trust’s information page about Gunsight Bridge. 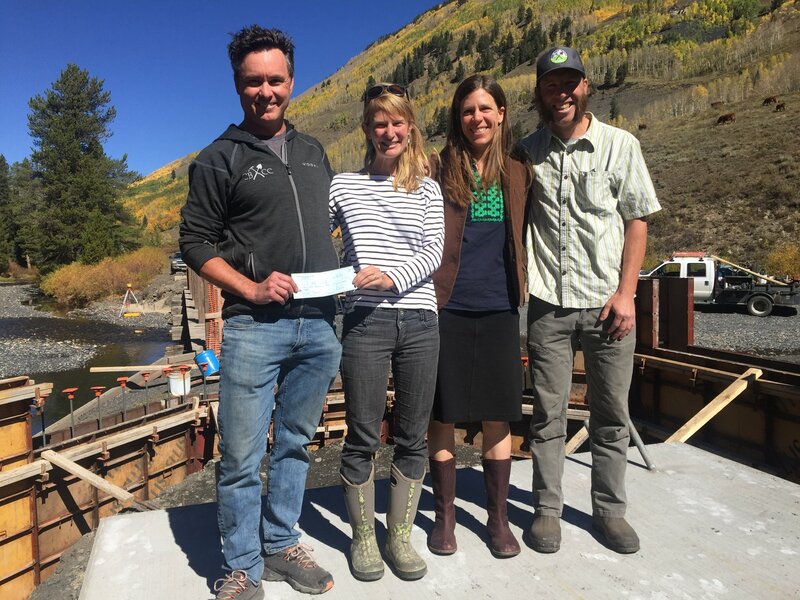 For CBMBA, we are grateful for all of the ways the Land Trust has supported our work, and we were excited to return the favor. Many of the trails we maintain cross Land Trust land, and they have been supporters of our in our own projects, like building the Baxter’s Gulch Trail and, most recently, putting the Baxter’s bridge in. Together, the Land Trust and CBMBA work to conserve our natural landscapes and provide sustainable opportunities for recreation. We are so happy to be able to support them in this latest epic project! If you want to support this project, too, please visit their site and make a donation.